The interstellar voyages of the Starship Enterprise have captured imaginations around the world for decades. Astronauts, movie makers, scientists, engineers and others from all walks of life cite "Star Trek's" science and technology as an influence on their lives and worldview. But why? What makes "Star Trek" the enduring and thrilling science fiction epic it is today? "I saw 'Star Trek' the original series as a little girl and for me it was really great because it talked about and it dealt with situations that were going on at the time, but you saw it with a lens of another place, another time, another world, another group of people," Jemison, a former astronaut and the principal for the 100 Year Starship Initiative, told SPACE.com. "So it was easy to actually do some of those morality plays and really bring a number of issues to the foreground and really talk about them." When Jemison — the first African-American woman to fly in space — began watching the original series, she felt affirmed by the diversity of characters represented on the show. At the time, that diversity wasn't present in the real-life astronaut corps. "I think the other thing that 'Star Trek' did was it basically said that humanity would make it through all of the conflicts and catastrophes that we were facing," Jemison said. "Star Trek's" particular brand of science fiction has also motivated other scientists. "I think it's one of those things it all goes back to a deep desire to see some very incredible things maybe come to pass one day," Harold White, a NASA engineer, said of his "Star Trek" fandom. "The idea of going 'beyond' is, I guess, just a soft terminology meant to capture anywhere in the cosmos so everyone has a soft spot for one of the old explorers. 'What's over the next hill' sort of things. There's something inside of us that resonates with that, so I think you see that in a lot of people not just in the space program." "Star Trek" serves as inspiration for the people responsible for making the next generation of science fiction movies today. "I'm a sci-fi nerd," Gary Whitta, the screenwriter for "After Earth," a new science fiction movie set for release on May 31, told SPACE.com. "I grew up on this stuff. I grew up watching 'Star Trek' and 'Battlestar Galactica.' This is the kind of stuff I've always wanted to do." Perhaps one of the most appealing aspects of the series is that it represents an imagined future for humanity. "'Star Trek' is supposed to be our future in space. It is not fictional — it is of course — but it is not intended to be a galaxy far, far away," Adam Schneider, the man restoring the original series' Galileo Shuttlecraft, said. "It is intended to be what we do on this planet with our capabilities over the next few hundred years, and, as such, it's inspiring ... It's the career I would have wanted to have." 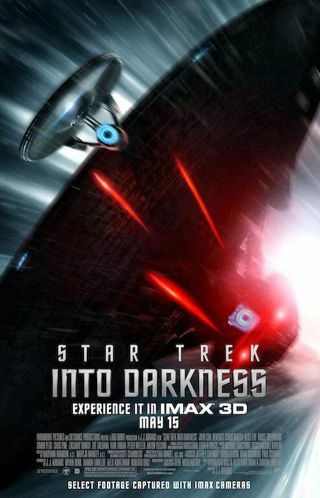 With "Star Trek Into Darkness," the most recent re-boot of the series, set for release tomorrow (May 16), a fresh stock of audience members might get a chance to experience that kind of inspiration. Jemison, however, is doubtful that the new films capture the attitude of the originals. A still publicity image of star-crossed lovers Spock and Uhura from the film “Star Trek: Into Darkness." "'Star Trek' is 'Star Trek' because it was 'Star Trek,' not because it was somebody else's version of it," Jemison said of the new movies. "My question is: Where is the hopefulness in it? … The science and the geekiness is important. It's not accidental." NASA is riding high on the "Star Trek" excitement. "Star Trek Into Darkness" director J.J. Abrams and some of the film's stars will take part in a Google+ Hangout with current space station astronaut Chris Cassidy tomorrow at 12:15 p.m. EDT (1615 GMT).